Added by Indo American News on April 14, 2019. In the cold and often rainy or snowy winter months, when you are in need of some warm comfort food, this dish is a perfect fit and is so easy to make. Below is a reprint of Mama’s Besan de Poode recipe, which is perfect with chutney and hot tea. It is reprinted with some additional information and directions. Besan (chickpea or garbanzo) flour is used throughout India to make many dishes and is commonly used for batter to make pakoras or fritters in. Besan is a most versatile flour that is also used in making boondi, laddu, papad, dhokla and many of the popular spicy snacks that are sold in stores. In the Punjab, the two most popular dishes using Besan are kaddi and besan di sabzi or gutte and of course there are several sweets dishes made with besan. Besan is also used to make this quick bread which resembles a flour pancake, except it is usually salty and spicy, though, when made thick and smaller in diameter, it is usually sweet and uses different types of aromatic herbs like saunf (fennel). You spread the batter in a circle over hot oil on a black tava (flatplate) and the sizzling sound and aroma immediately makes your mouth water in anticipation! Besan is high in carbohydrates and somewhat high in protein but has no gluten, which makes it not suitable for those trying to lose weight (especially when it is fried). Besan is rich in folate, iron, magnesium (47%), phosphorus (45%) and potassium (18%) as well as thiamin and vitamin B6. Besides these attributes, besan also makes an excellent scrub and mask for skin care and can also help in fighting seasonal allergies during the cold months. In home remedies, besan poode are given to people to help reduce their sugar levels. The spicy besan pooda is a comfort food often eaten with pickles and is most satisfying eaten during the rainy Monsoon season, along with some hot tea. Poode are also called “chilla” by people from Uttar Pradesh. You can even make sweet poode using wheat flour, but that is an entirely different recipe. Spices (to taste): namak (salt), mirch (red pepper). If desired, add ajwain (bishop’s weed, caraway, carom seeds, or thymol seeds) for a slightly bitter taste. 1. Chop the onions and set aside. 2. Mix the chickpea flour, yogurt and water together; then add the onions and spices and beat the mixture till it becomes a paste: it should not be too thin else the pooda will not cook and will remain wet inside. 3. For each pooda, heat the oil on a high flame on a tava (hotplate) or in a frying pan. Pour a small amount of mixture and spread it to make a 6-inch circle. When tiny holes start to form on the surface, check to see in the bottom side is cooked. If so, use a spatula and flip the pooda over. 4. Cook the other side till the pooda is not moist, but do not let it cook too long or become brown. 5. 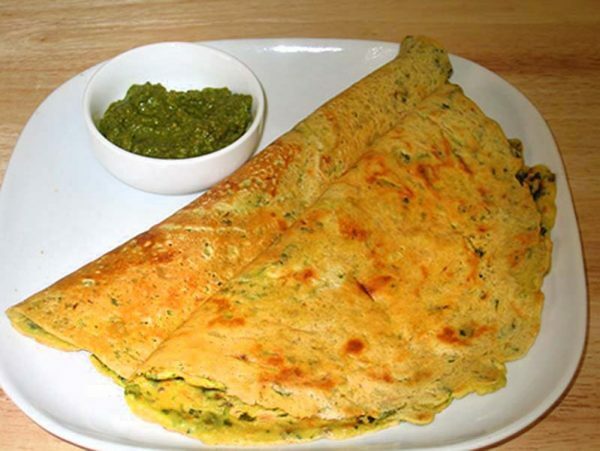 Place the pooda on a plate and serve with mint chutney or ketchup. The main spice that gives Indian food its distinct yellow coloring is haldi (turmeric) although too much of it can cause the food to taste burnt and inedible. For centuries, turmeric has also been used in rural India for its ayurvedic healing qualities as a first aid for minor scrapes, burns, infections and insect bites. In the winter months when you are more prone to getting a cough or some other soreness or mild internal infection, drinking some haldi can do quick wonders, though the taste takes some getting used to. Simply warm 1 teaspoon of haldi in warm milk and drink it down before sleeping for 4 days to a week. The infection or inflammation will go down immediately and you’ll feel better in the morning. Shakuntla Malhotra is a skilled cook of Punjabi dishes made in the old-fashioned style that she learnt as a young woman in her ancestral home in Lyallpur, India (since renamed Faisalabad) before it became part of Pakistan after the Partition in 1947. People have often admired her cooking for its simplicity and taste that comes with each mouthful. Even in her early-nineties, she continues to cook daily and agreed to share her delectable Punjabi recipes for future generations.